Raleigh is also known as the research triangle because of its universities. It is the capital of North Carolina. It is also known as the “City of Oaks” because of the presence of large number of Oak trees. 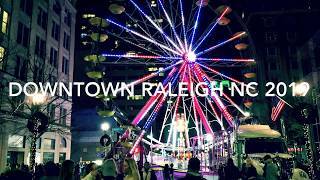 The city is named after Sir Walter Raleigh and was one of the few earliest planned cities of US. North Carolina museum of art – Started in1956, it has around 5000 art pieces and an amphitheater. Pullen Park- Huge amusement park spread over an area of 67 acres. Enjoy Boating and mini train ride. William B. Umstead state Park- It is a great place for hiking, mountain bike riding and has beautiful lake view. JC Raulston Arboretum- This garden has a huge collection of Plants and is open to all with free entry. Neuse River Trail- This trail is along the bank of river Neuse and an awesome place to walk or go cycling. Lake Crabtree country Park- you can enjoy the water activities here. Aloft Raleigh- Provides you with outdoor pool and a bar.